Iraq has called on Turkey to “immediately” withdraw forces, including tanks and artillery, it has deployed in the country’s north without Baghdad’s consent, the premier’s office said on Saturday. “The Iraqi authorities call on Turkey to… immediately withdraw from Iraqi territory,” the statement said. “We have confirmation that Turkish forces, numbering about one armoured regiment with a number of tanks and artillery, entered Iraqi territory… allegedly to train Iraqi groups, without a request or authorisation from Iraqi federal authorities,” it said. 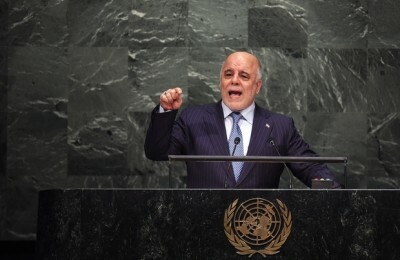 The deployment “is considered a serious violation of Iraqi sovereignty,” it added. Turkey, however, later denied that it has expanded its military activities in northern Iraq after it deployed troops close to an area controlled by the Islamic State group. “The camp in Bashiqa, 30 kilometres north east of Mosul, is a training facility established to support local volunteer forces’ fight against terrorism,” Prime Minister Ahmet Davutoglu said in a televised speech, denying reports that the deployment was in preparation for a ground operation against IS. Turkish media reported that around 150 Turkish soldiers backed by 20 to 25 tanks had been sent by road to the Bashiqa area near Mosul, the Islamic State group’s main hub in Iraq. Peshmerga forces from Iraq’s autonomous Kurdish region are deployed in the area, and Turkey’s Anatolia news agency said the troops were there to train them. IS overran swathes of territory north and west of Baghdad last year, and Iraqi forces backed by US-led air strikes are battling to drive the militants back. The peshmerga are one of the most effective Iraqi forces in the anti-IS fight, but coordination between them and the federal government in Baghdad has generally been poor.